Revlite Laser makes use of the PhotoAcoustic Technology Pulse (PTP), which is gently delivered deep into the skin without harming the skin’s surface. This shatters the clusters of pigment resulting in an immediate noticeable lightening effect. 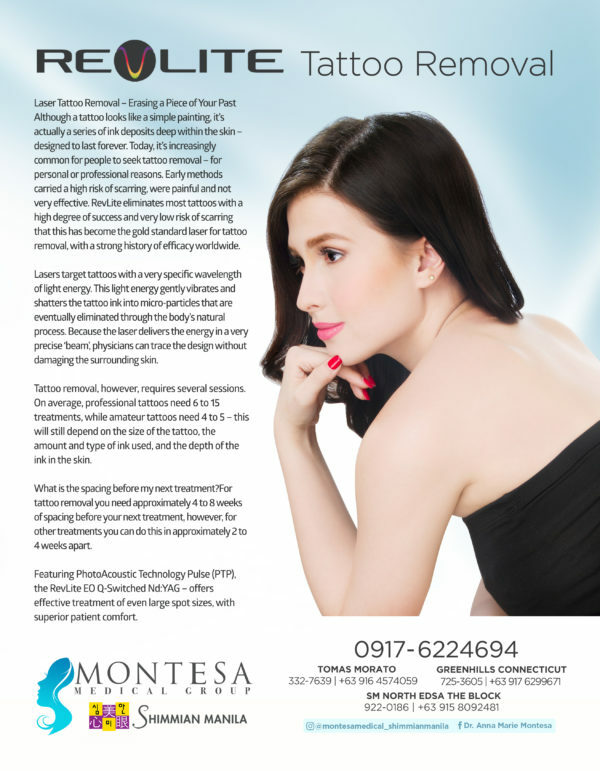 Aside from underarm discoloration, it is very effective for age spots, melasma and tattoos too. RevLite Laser is the next generation of Q-switched laser technology — a multi-purpose, multi-wavelength aesthetic medical laser that offers maximum power and versatility for a broad range of indications on all skin types. RevLite Laser utilizes an extremely high-speed shutter to produce nanosecond pulse widths, enabling highly effective procedures with less heat and increased safety. Featuring PhotoAcoustic Technology Pulse®, the RevLite Laser delivers very narrow pulse widths at peak energy, even at larger spot sizes. The speed and power of RevLite® can create a superior PhotoAcoustic rejuvenation effect, including a more refreshed appearance, a reduction in fine lines and wrinkles, smoother texture, tightening and decreased pore size. By storing energy between pulses, an EO (electro-optic) Q-switched laser is able to achieve a shorter output pulse. The Q-switch acts as a high-speed shutter, allowing the RevLite® laser to produce peak power output of 200 megawatts in a 5 – 20 ns pulse width. This creates a PhotoAcoustic effect, delivering peak energy with such force that the target molecule vibrates and shatters. The energy is delivered throughout the epidermis faster than the normal relaxation time of healthy tissue. As a result, this technology enhances safety and eliminates the need for skin cooling or any concern for scarring. During your Revlite Rejuvenation procedure, a special hand piece is passed over the treatment area, dispensing the focused laser energy deep within the targeted tissues in a brief treatment that takes only about 10 to 15 minutes to perform. Facial lines and wrinkles, and discoloration and age damage on the face and other areas of the body, are ideally suited for treatment with the Revlite Rejuvenation procedure. The system is also used to shrink the appearance of large pores, and to improve the texture and tone of skin, resulting in a firmer, smoother, more youthful appearance. The Revlite system offers gentle treatment of cosmetic issues, achieving results and encouraging the development of the skin’s natural collagen, which softens wrinkles and lines while firming and toning the skin in the treatment area. There is no downtime associated with the Revlite Rejuvenation treatment, and most individuals can resume their normal activities right after the procedure. You may experience some slight, temporary redness right after the procedure, which usually disappears within a few hours to a day after treatment. You can expect to see initial results right after treatment, with continued improvements during the weeks following treatment, as new collagen continues to form in the treatment area. Revlite is now available in all Montesa Medical Group branches up to 50%off. When melanin, which gives our skin its color, is concentrated in one area, it causes unwanted spots in the skin. This is usually a result of overexposure to the sun’s damaging ultraviolet rays. 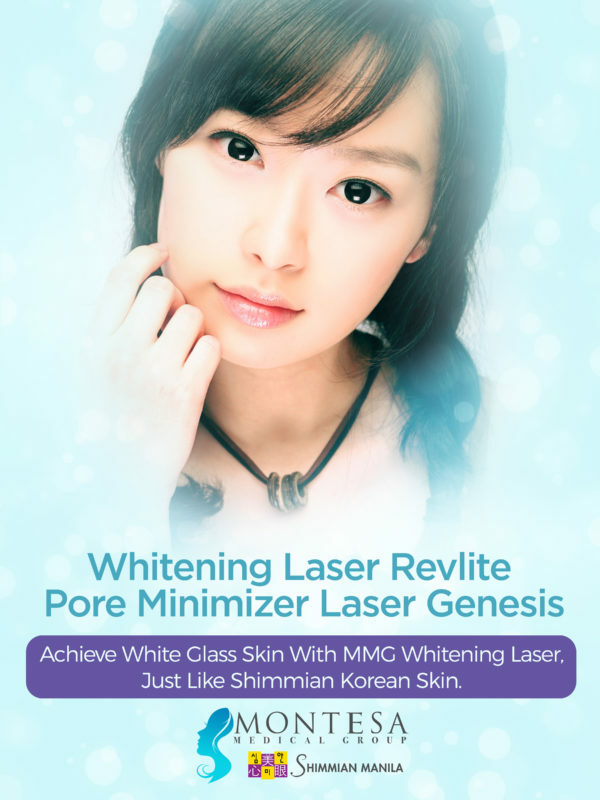 RevLite produce a special wavelength of light that is absorbed by pigment lesions which in turn vibrates and shatters the pigment, breaking the concentrated melanin into micro particles and, therefore, lightening the lesion. You’ll notice the spot turning gray or white for a few minutes and then turn darker and slough off completely within one to two weeks. RevLite works well to remove brown age spots, freckles and other birthmarks (cafe-au-lait spots and Nevus Ota). Shave, tweeze, wax, and pluck no more! RevLite represents the next generation of hair removal – requiring just a few treatments for near-permanent results. As the laser wavelength passes through the skin and is absorbed by the hair follicle, the light damages the hair follicle and disrupts its growth, causing the hair to fall out. Any hair that grows back will be thinner and finer. 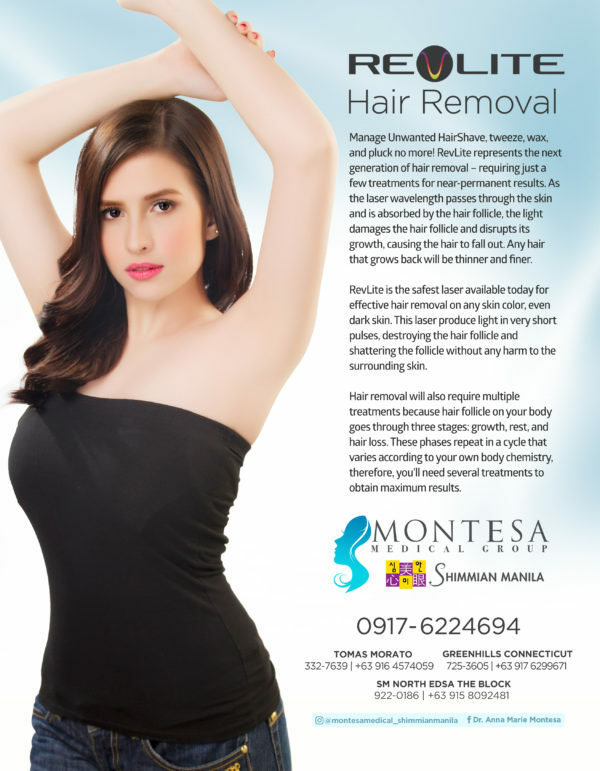 RevLite is the safest laser available today for effective hair removal on any skin color, even dark skin. This laser produce light in very short pulses, destroying the hair follicle and shattering the follicle without any harm to the surrounding skin. Patients who used to pluck, wax or shave is always left with dark underarms. Not everyone is a good candidate with underarm skin peeling, that some patients are left with darker skin tone than when they started. Factors that may cause this is excessive sweating, hormones… Or, the patient simply does not respond well with peeling. RevLite is a painless treatment that whitens the underarms with no downtime. It even removes the hair as a side effect. No need to be embarrassed when you have Revlite, it treats chicken skin too. Although a tattoo looks like a simple painting, it’s actually a series of ink deposits deep within the skin – designed to last forever. Today, it’s increasingly common for people to seek tattoo removal – for personal or professional reasons. Early methods carried a high risk of scarring, were painful and not very effective. RevLite eliminates most tattoos with a high degree of success and very low risk of scarring that this has become the gold standard laser for tattoo removal, with a strong history of efficacy worldwide. Lasers target tattoos with a very specific wavelength of light energy. This light energy gently vibrates and shatters the tattoo ink into micro-particles that are eventually eliminated through the body’s natural process. Because the laser delivers the energy in a very precise ‘beam’, physicians can trace the design without damaging the surrounding skin. Collagen provides the essential support network for our skin. As we age, collagen breaks down, causing lines and wrinkles. Sun exposure damages collagen too, and can cause pigment problems (brown spots), uneven tone and rough or leathery texture. RevLite use a precise wavelength of light energy to target underneath the skin, deeper than any lotions or moisturizer can, stimulating collagen production at the source. As new collagen is generated, lines and wrinkles are reduced which then create a refreshed appearance, smooth texture, more even skin, and a decrease in pore size. Revlite laser toning is a non-invasive treatment that uses light energy to gently stimulate collagen production, pore reduction, remove pigmentation, and reduce fine lines and wrinkles. Revlite works in that it stimulates the development of new collagen. Collagen is the protein that holds our skin together that breaks apart as we age due to years of sun exposure and other factors. The overall effect is improved color and texture that will make the face more radiant. It is common to see women with discoloration in their elbows, knees and bikini because these areas are more prone to friction and are normally dry. It is advised to moisturize and hydrate these areas before treatment, and let Revlite do the rest. What does the laser therapy feel like? Many people describe the feeling of non-ablative laser therapy as a tingling sensation. The impact of the energy from the pulse of light is similar to the snap of a very thin rubber band. Anesthesia is usually not necessary, but you may request a topical cream if you wish. For those having tattoo removal, some patient may fell mild discomfort as the physician traces the design because the tattoo ink absorbs the laser energy. How many treatment sessions will it take before I see results? Most pigmented lesions are removed within four to six treatments but some deeper lesions will require more treatments. Tattoo removal, however, requires several sessions. On average, professional tattoos need 6 to 15 treatments, while amateur tattoos need 4 to 5 – this will still depend on the size of the tattoo, the amount and type of ink used, and the depth of the ink in the skin. Hair removal will also require multiple treatments because hair follicle on your body goes through three stages: growth, rest, and hair loss. These phases repeat in a cycle that varies according to your own body chemistry, therefore, you’ll need several treatments to obtain maximum results. What is the spacing before my next treatment? For tattoo removal you need approximately 4 to 8 weeks of spacing before your next treatment, however, for other treatments you can do this in approximately 2 to 4 weeks apart. The treated area may feel similar to a mild sunburn. Laser skin rejuvenation may cause a mild to moderate redness, which usually fades within an hour or a day after treatment. No specific post-care is needed, although you will be asked to avoid sun and certain skin products for a period of time. It is important to follow your physician’s instruction and ask if you have any questions.